Kids ‘N’ Caboodle is an online shop which sells special, personalized, handcrafted baby shoes and booties. The shop's founder is a former elementary and nursery school teacher who has owned a successful children’s retail store for over 22 years. While a merchandise buyer for the store, she enjoyed finding unique, adorable, and affordable baby gifts for her customers to select. For Kids ‘N’ Caboodle she has chosen suppliers whose products are of excellent quality, have great product reviews from current customers, and above all have excellent customer care reports. These personalized, keepsake baby shoes and booties will remind your friends and family that you took the time to think about them personally. Kids ‘N’ Caboodle sent us an adorable pair of Soft Soul baby shoes personalized for our new baby girl. We chose the bubblegum shoe with eggplant lettering/ankle and Nicole style font. The shoes are made from a soft, high quality leather. They are hand cut, sewn and embroidered by leather-craft artists from Canada who have worked with the finest leathers for over 20 years. The soles are made with textured suede to make them skid resistant. We love our new shoes! 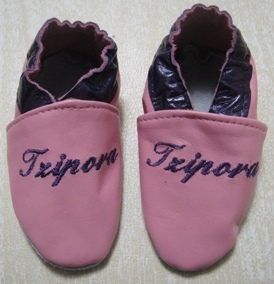 We bought them in a large size because Tzipora won't need any kind of shoes until she's at least 6 months old. The shoes are incredibly soft, and I love how it's personalized. In a home with tons of hand-me-downs, I feel good giving her something that is really just for her. There were so many choices of colors that it was hard to narrow it down, but I really like how it came out. I can't wait until her feet are big enough so I can put them on her when we go out! And when she grows up, they'll be a sweet keepsake for her to have as an adult. 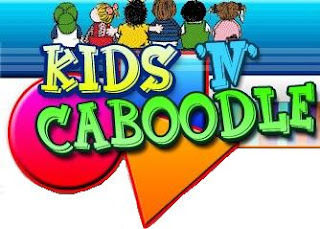 Overall: We give Kids ‘N’ Caboodle a 9/10! We were sent a pair of personalized SoftSoul shoes from Kids 'N' Caboodle free of charge for the sole purpose of this review; no other compensation was received. All opinions expressed are my own. Nice blog....i would like to read it again..
For more detail about bag and bag manufacturers please website.You will get quality as well as fashion.